It is demoralizing to observe how a partnership for peace and mutually beneficial exchange could so easily be diminished. And it is chilling that such a consequential decision will largely be shaped by temporary moods. Emotional geo-politics - not a good combination at all. I have been reminded in recent weeks of one of the passages in George Kennan's Around the Cragged Hill about American politicians who insist on referring to the United States as "this great country." They may obviously be pandering, but Kennan suspects that they are "trying to overcome a certain uncomfortable doubt about this in their own minds." They end up sounding like they are trying to convince themselves. Kennan couldn't be more right when he writes: "We could do, it seems to me, with less frequent reassurance on this point" though he naturally adds that the U.S. is a great country. The lies, the tone, and the inconsistencies (a satirical site described a warnings of Schrödinger’s immigrant who ‘lazes around on benefits whilst simultaneously stealing your job’) were exhausting. They are absolutely not new (as The Economist reports, "Britain has a long and well-observed tradition of fabricating facts about Europe—so much so that the European Commission ... set up a website to debunk these lies in the early 1990s. Since then the EC has responded to over 400 myths published by the British media") but that doesn't make them any easier to stomach. 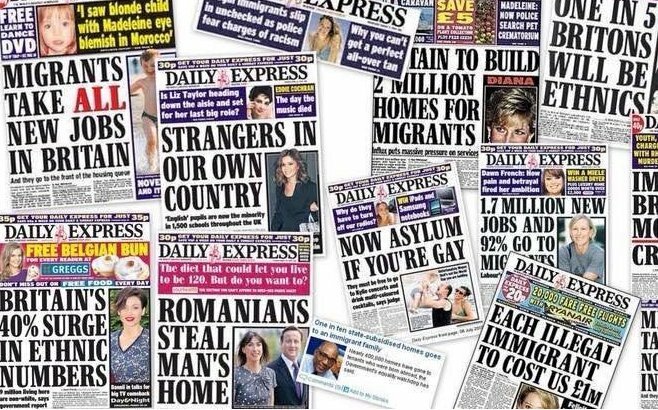 Daily Mail promised "a great future outside of a broken, dying Europe" on its front page, Daily Express used cartoons with messages like "We demand our country back" and The Daily Telegraph asserted with no evidence whatsoever that "A world of opportunity awaits" after Brexit. ... Credible, independent institutions like the IMF, OECD, Bank of England, Institute for Fiscal Studies, and London School of Economics have provided similar warnings. An Ipsos/MORI poll showed that 9 in 10 professional economists think Brexit would hurt the economy. The EU is facing major challenges and in need of reform. Some of us have been significant critics of the EU. But Britain is far better off “in” leading that reform than “out” and isolated. Modern 21st century economies thrive on connections, trade, and exchanges between people and ideas. Ben Chu: How the Leave campaign has eroded trust in British institutions --- "... this style of campaigning does damage. If you trash the reputations of institutions, if you cross those lines for short-term advantage, there is a cost. Others will cross those broken lines. And they may have even fewer scruples. ... If institutional organisations, or rather the people in them, are wrong or abuse their authority, there must be a framework of accountability, transparency and checks and balances. Other institutions can police the institutions – they should not be above challenge. But demagogic dismissals of elites and experts, such as the infamous comment from Michael Gove that “people in this country have had enough of experts”, merely pollute the waters of public life. If a serving cabinet minister says we ought to be contemptuous of qualified analysis, that sets a baleful example." Sam Bowman on political norms: " All politicians lie and all campaigns are dirty, but the Leave campaign has been an order of magnitude worse than usual. ALL of Leave’s key messages have been bare-faced lies that Leavers know are lies: about the UK’s contribution to the EU, about Turkey’s chances of joining, about the UK’s power to veto EU treaties. ... ” The UK has maybe the best political culture in the world and Leave have threatened that. I like and respect many Leavers, but I’ve never shared their enthusiasm for democracy – I want liberty and prosperity, and I don’t want to trade that in just to give my stupid next-door neighbours more power over my life. To the extent that the EU does restrict democracy it is often for the best, preventing governments from doing nasty, illiberal things (like restricting immigration or subsidising domestic firms). There’s a small chance that a Jeremy Corbyn could be elected – if he is, under the British political system he would have basically unlimited power to do whatever he wants. The EU limits that power, and in my view that’s a good thing." Net migration to the UK stood at 333,000 in 2015. 630,000 people moved to the country in that year, and 297,000 left, according to the Office for National Statistics, giving us the oft-quoted net migration figure of 333,000. Of those who immigrated to the UK, there were slightly more non-EU citizens than EU citizens. The Government’s stated goal is to have net migration in the tens of thousands. Many argue that cutting migration to this level could be bad for the economy. Regardless, because of high levels of non-EU migration – which the Government can already control through the visa system, leaving the EU and ending the automatic right of EU citizens to live in Britain would not automatically achieve this target. ... In a major speech on immigration, Michael Gove warned that more arrivals could make the NHS “unsustainable” by 2030. The NHS itself disagrees. Chief executive of NHS England has pointed out that 130,000 European-born doctors, nurses and care workers are vital to keep our health and care services functioning. It is unclear what their working status would be in the event of Brexit, but Vote Leave has indicated it would want them to stay. Migration can benefit the NHS in other ways. About 78 per cent of working age EU migrants in the UK are in work (a higher proportion than among UK nationals), so most are paying tax and contributing to the NHS – in theory making it better able to cope with the higher numbers of patients. Migrants are also more likely to be young and fit so less likely to need the NHS. Simon Hix: Is the EU really run by unelected bureaucrats? : "the Commission’s power to propose legislation is much weaker than it at first seems. The Commission can only propose laws in those areas where the EU governments have unanimously agreed to allow it to do under the EU treaty. Put another way, the Commission can only propose EU laws in areas where the UK government and the House of Commons has allowed it to do so. Also, ‘proposing’ is not the same as ‘deciding’. A Commission proposal only becomes law if it is approved by both a qualified-majority in the EU Council (unanimity in many sensitive areas) and a simple majority in the European Parliament. ... Second, the Commission President and the Commissioners are indirectly elected. Under Article 17 of the EU treaty, as amended by the Lisbon Treaty, the Commission President is formally proposed by the European Council (the 28 heads of government of the EU member states), by a qualified-majority vote, and is then ‘elected’ by a majority vote in the European Parliament. In an effort to inject a bit more democracy into this process, the main European party families proposed rival candidates for the Commission President before the 2014 European Parliament elections. Then, after the centre-right European People’s Party (EPP) won the most seats in the new Parliament, the European Council agreed to propose the EPP’s candidate: Jean-Claude Juncker." Britain should vote to stay in the EU — FT.com "The positive case for Britain in the EU is easily made. To abandon the cause of constructive reform of an admittedly imperfect EU would be more than defeatist. It would be a gratuitous act of self-harm. ... The debate has been depressingly transactional. The economic costs of withdrawal are substantial; but the Remain camp has indulged in pocketbook scaremongering. The Leave camp has been superficially patriotic, at heart mendacious. Britain does not contribute a net £350m a week to the EU budget. Savings will not go automatically to the National Health Service. Turkey has about as much chance of joining the EU by 2020 as Istanbul being renamed Constantinople in a revived Byzantine empire. To be sure, Leave’s focus on immigration resonates with voters. This may account for a tightening of the polls, to the point where Brexit is a real risk. The influx of EU migrants, far greater than successive governments predicted, has stirred fears about jobs, public services and British identity. “Take back control” in the name of democracy is a seductive slogan in the age of globalisation." Brexit Referendum: Five reasons the UK should stay: "The Eurosceptics of the Leave campaign stress the loss of sovereignty and the perceived erosion of democracy that EU membership entails. They view the referendum as a rare opportunity to vote for real change in Britain’s relations with Europe and avoid membership in “an ever closer union.” But the UK does not need to leave to avoid finding itself in an ever closer union: it already has won significant concessions from the EU, including a permanent opt-out from the Schengen passport-free area and from euro adoption, safeguards to protect the euro “outs” from the euro “ins,” a budget rebate, and firm commitments on EU deregulation and competition. Most of these concessions pre-dated Prime Minister Cameron’s renegotiation of Britain’s place in the EU, which culminated in an agreement reached at the EU Summit in February"
NYT staff editorial: Britain’s Dangerous Urge to Go It Alone: "There is no argument that the European Union is a flawed institution. Its dysfunction has been on display in its fitful handling of the Greek debt and refugee crises, its bureaucracy is pathetically slow to recognize or correct its failings and it often acts like an out-of-touch and undemocratic elite. Part of that is the inherent inefficiency of an institution of 28 member states with big differences in size, wealth and democratic traditions, and which participate to different degrees in the single currency and border-free zone. Yet the E.U. is an extraordinary achievement, a voluntary union of nations whose histories include some of the bloodiest wars ever waged. However flawed the bloc, it has replaced blood feuds with a single market, shared values, free travel and labor mobility." InFacts Vote Leave = LOSE control : "If we leave Europe, we won’t be in the room when the other 27 nations decide what to do. Instead, we’d tag along, as a follower, becoming a rule-taker rather than a rule-maker. Our other allies would listen to us less and our government would have less power to do the things we want. Lead Europe, don’t leave Europe." IMF Executive Board Concludes 2016 Article IV Consultation with the United Kingdom: "The UK economy has performed relatively well in recent years, with economic growth consistently near the top among major advanced economies and the employment rate at a record high. However, growth has slowed somewhat in the first part of 2016, as heightened uncertainty ahead of the referendum on EU membership appears to be weighing on investment and hiring decisions. In a baseline scenario in which the UK remains in the EU, growth is expected to recover in late 2016, as referendum-related effects wane, and to average around 2.2 percent over the medium term. ... However, this broadly positive baseline scenario is subject to risks, including those related to the referendum"
‘Brexit’ Vote: Investors Go From Denial to Fear - WSJ: "If Britain votes to remain, it’s natural to expect a big snap back in everything that’s sold off, boosting sterling, the euro, peripheral country bonds and shares, and hurting safe bonds and the Swiss franc.And this is the problem facing investors. No investor should bet their portfolio on the toss of a coin, but diversifying between heads and tails amounts to accepting they will win nothing." Britain’s E.U. vote could bring Cameron’s government crashing down: "Among the prime minister’s gravest misjudgments, Mortimore said, was that he could rely on the small clique of Oxford-educated politicians who with Cameron form the upper echelon of Conservative Party politics. Instead of loyalty, several have jettisoned the prime minister, and one — the shaggy-haired, populist former London mayor Boris Johnson — has all but declared his intention to topple the man who has led Britain for the past six years. ... But even if Cameron pulls out a close victory, he could still be in peril, with pro-Brexit Tories blaming him for undermining their long-awaited chance to break free of the E.U." ... under pressure from the euroskeptics within their party’s ranks, [ministers of the Conservative government] find it difficult to break out of negative terrain. For most of the campaign, they have defended European membership merely as the lesser of two evils. At times, this bitter and bad-tempered referendum resembles a battle between those who want us half out of Europe and those who want us fully out. It is not too late to make the positive case for Britain’s future in Europe. The 2014 Scottish independence referendum is a stark reminder of the dangers of excessive negativity. Reaffirming Scotland’s status as part of the United Kingdom required a patriotic vision and a positive, forward-looking mission statement. The same holds true in this referendum. Traditional patriotism and modern realities need not be at odds [emphasis added]. In an interdependent world, each country must strike a balance between the autonomy it desires and the cooperation it needs. In the European Union, Britain can play a constructive role without either subjugating its identity to a European superstate or lurching backward into a “Little England” mind-set. It will almost certainly be the biggest economic and political decision the British people will make in our lifetimes. It is a question about the sort of country Britain wants to be in the world, and will affect families, jobs and the future of our country for decades to come. As citizens of the United Kingdom take stock of their relationship with the EU, you should be proud that the EU has helped spread British values and practices – democracy, the rule of law, open markets – across the continent and to its periphery. The European Union doesn’t moderate British influence – it magnifies it. A strong Europe is not a threat to Britain’s global leadership; it enhances Britain’s global leadership. The United States sees how your powerful voice in Europe ensures that Europe takes a strong stance in the world, and keeps the EU open, outward looking, and closely linked to its allies on the other side of the Atlantic. So the US and the world need your outsized influence to continue – including within Europe. Martin Wolf: Britain’s friends are right to fear Brexit: "How do most informed Americans, Australians or, for that matter, other Europeans, react when they see the UK considering the end of a relationship that gives it a voice in the direction of the continent, while being free from so many of the burdens and mistakes of our partners? They think it mad. Nicely, but firmly, Mr Obama should say so." Dalibor Rohac: It is Mr. Obama’s job to talk about Brexit: "The concern about the EU’s transformation into a dystopian superstate is misplaced. If Europe is on a slippery slope, it is of a very different kind. Under the pressure of the EU’s own dysfunctions, the rise of populist and nationalist movements, and the Kremlin’s continuing interference, political order on the continent is becoming fragile. Or, as the former Conservative Party Leader and Foreign Secretary Lord Hague wrote earlier this week, “being dominated by Europe was a serious threat to us 20 years ago, but now, having seen off the euro and other flawed ideas, a bigger threat is the western world falling in on itself, splintered and divided.”"
Council on Foreign Relations: The Debate Over 'Brexit': "Under the 2009 Lisbon Treaty, the UK would have a two-year period to negotiate its withdrawal. These negotiations would be extremely complex. The UK would need to determine numerous transitional procedures (PDF) for disentangling itself from EU regulations, settling the status of the millions of UK citizens residing in the EU, and deciding the future of UK-EU security cooperation. The final withdrawal deal must be approved by a supermajority of EU countries, as well as by the European Parliament." A vote for Brexit is a vote against Toryism | Coffee House: "There is, I am sure, an entirely reasonable case to be made for leaving the European Union, it’s just that, for the most part, we’ve not heard it. Instead, the dominant feature of the Out campaign has been its anger. Many of these people really do seem to think this is some kind of struggle for national liberation." 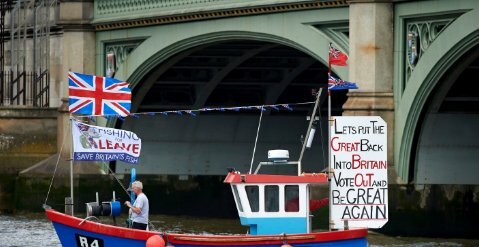 Kirkegaard: Brexit Scenarios for June 24: "[if the UK votes to loves,] the EU—just as the euro area could afford to wait longer for a solution than Greece during the euro crisis—can afford to wait much longer than can the UK for a solution to be found. " Reuters: Brexit would cost Britons a month's salary by 2020 - OECD: "He said official figures released on Wednesday showing Britain's economic growth slowed in the first three months of the year underscored how the possibility of a so-called Brexit was already weighing on confidence." Peter Goodman: ‘Brexit,’ a Feel-Good Vote That Could Sink Britain’s Economy - The New York Times: "That Britain is even contemplating an exit speaks to the ferment shaping politics in much of the world ... With the vote, Britain is determining its place in the world. Yet an argument over British identity is masquerading as an economic debate."